Now, I'm a roadie through and through – I like speed, I've never ridden anything with tyres wider than 25mm and certainly never used a rack so when I arrived at road.cc to collect the Kinesis Decade Tripster I wasn't quite sure what I'd let myself in for. It turns out though that the last couple of months of riding have been some of the most fun and carefree I've ever known. Decade are part of Kinesis bikes and the Tripster is one of two road bikes being described as a fast commuter but thanks to the sheer amount of build options you can put in place once you've bought your frameset there is a world of possibilities. Your £499 gets you a 7005 series double butted alloy frame, Kinesis's own carbon bladed fork (alloy steerer), the alloy seatpost, seat clamp plus headset. A size range of 51 to 63cm in 3cm increments should fit the majority of the cycling public. Geometry is taken from Kinesis' Crosslight range with a tweak to the headtube length, 150mm on our test model which gives a slightly more upright position. The option of running either 700c, 29er (which is basically 700c anyway) or 26' is a bonus, giving a choice of wheels and tyres depending on your style of riding or terrain. The huge clearances allow up to 47mm tyres with 700c and 1.5' on the 26' diameter. A stated weight for our 54cm of 1700g is none too shabby when you take into account the intended use. 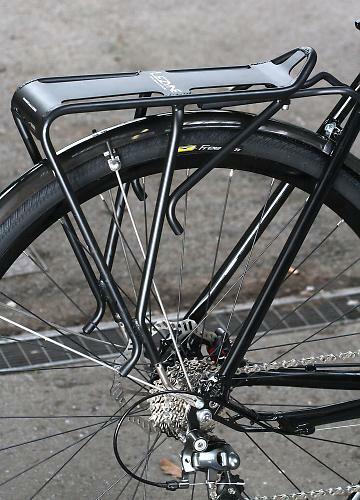 To cover all bases there are mounts for mudguards, rack and discs with guides for either the rear brake cable or hose on both the downtube and non drive chainstay. The machined 135mm dropouts house the mount for the 'inboard' disc calliper keeping things out of the way of the rack. The build quality is as high as we're used to seeing from Kinesis, solid looking welds topped off with a deep paintjob. The black option here looks great with the black components but it's also available in blue. The Kinesis fork has, as you'd expect, a 1 1/8' steerer fitting into the integrated headset of the frame. The straight carbon legs match the frame having disc and mudguard eyes, unfortunately though no cable guide so the brake hose is taped to the fork. Flats, drops, knobblies, slicks – whatever you fancy you can stick it on the Tripster to work with your wheel choice. 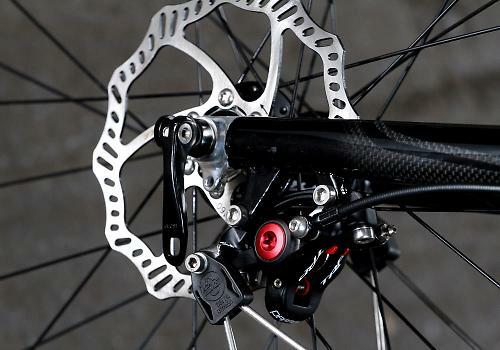 Our build contains a few goodies, most notably the TRP Parabox braking system. 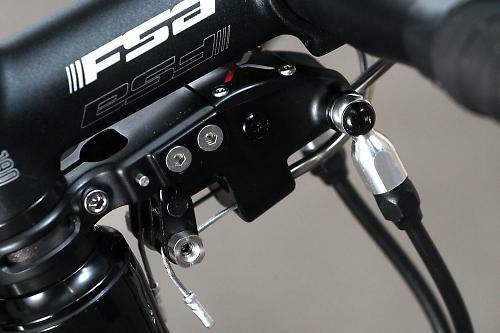 The little box of tricks under the stem converts the cable input into hydraulic pressure. The kit itself is pretty pricey at over £300 but that does include the convertor, front and rear callipers, all hoses and 160mm rotors. Microshift's Xona components see a move away from the usual suspects providing the front and rear mechs plus 10 speed shifters. The shifters use two buttons behind the brake lever, one paddle like and one shaped almost like the shifter button on Shimano's Sora. On the rear changer, swing the paddle inwards to shift up the cassette while press the button above will bring you back down. Both button and paddle are positioned perfectly in terms of where your fingertips sit while riding the hoods. 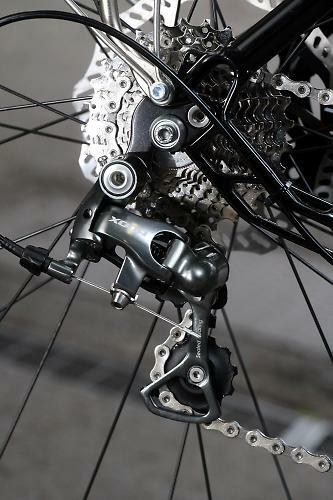 Price comparison, you're looking at around 105 money and while the shift isn't quite as clean as Shimano's mid range group the Xona has a positive clunk to it as you move between gears. The hoods are comfy too, which is what you want on a bike intended for time in the saddle. The mechs seem to handle the shift well and even with all the road crap sprayed up on country lanes the gear change remained spot on each time. Bars and stem are provided by FSA and are again well suited to the Tripster's personality: functional and happy to take a bit of a pounding. The alloy Vero oversized bars have a shallow drop to help you get out of the wind without needing to drop into a full race tuck. Freedom, based in Marin County, California, supply the Relax saddle, a well padded utilitarian perch that certainly looks a chunky beast. 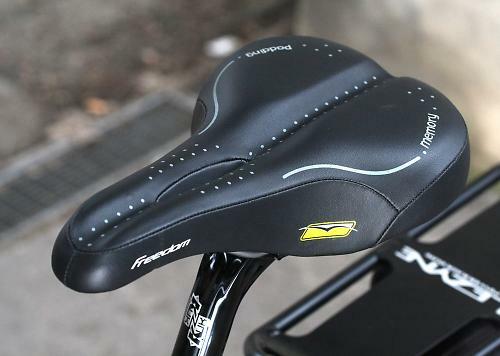 The padding though is quite firm so you don't get any of that bouncing in the saddle once your cadence picks up. For a bit of decoration our Tripster is kitted out with some extras from Leyzene and SKS; we've got a rack, bottle cages and mini pump plus full mudguards. As mentioned above, you can either go for 700c, 29er or 26' wheels though its recommended you use a minimum tyre width of 1.5' with the 26' wheel to keep the bottom bracket height the same. The Maxlights here are pre-production models of Kinesis's 29er's, tubeless ready 32 spoke rims mated to disc hubs. 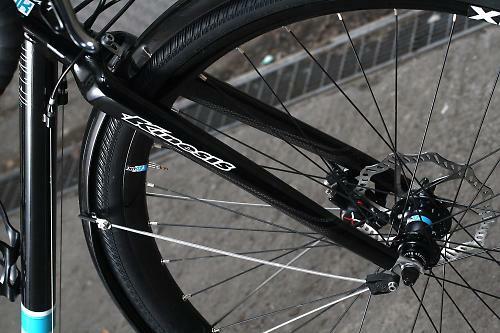 Production weight is said to be 1800g per pair which is pretty good for such a strong looking wheelset. Touring tyres are from Freedom in 700c x 37mm size with a decent enough tread to handle the likes of hard packed gravel tracks as well as tarmac. They are good all-rounders coping with everything thrown at them. Obviously specific tyres for the terrain you're on will benefit but these rolled well and showed no signs of marking or cutting. The type of kit you decide to adorn your Tripster with is going to reflect your riding style and what you want out of the bike but one thing is for sure is that you'll receive a responsive ride from the 7005 series alloy frame. With the tyres pumped up hard for road use the feedback is of a stiff frame that has enough compliance to take out the worst of the road buzz. The 150mm long headtube gives a sensible seat to bar drop for all day in the saddle or an extra bit of visibility in traffic. The Freedom saddle is surprisingly supportive for such a plush looking perch and adds to the all day comfort. The longest stretch I put in was 5 hours of continuous riding and when I got off there wasn't a single ache or pain anywhere. Strip the Tripster back to just its necessary components and give the pedals a poke and it'll respond accordingly thanks to the shared DNA with its stable mate, the Crosslight. Obviously the 10.5kg weight of our test bike means it isn't a sprinter but once rolling, acceleration is brisk. Stick on a set of slicks and there is no reason you can't fling it about like a race bike. Even fully kitted (12.1kg) the Decade never feels sluggish, a little more relaxed maybe, but that's the beauty of the frame. Ride it to work all week with the mudguards, rack etc. taking in the lanes or the traffic filled city centre and it swallows up the miles easily. Come to the weekend, strip it down and head for the hills or local trails and play about with it. Part of my commute allows the use of the towpath at the side of the Kennet and Avon canal and this is where the Tripster came into its own. Hard packed gravel track full of potholes and puddles sees the Crosslight influence comes through and the whole journey was done at speed, hammering through the holes and loose gravel as fast as possible. The carbon fork takes the impacts well and absorbs a lot of the bumps and jolts even with the tyres pumped up to max, keeping the steering direct without being twitchy and easily controllable if traction does start to break. Loading up the Tripster sees very little change in the handling. I stuck a child seat onto the rack and strapped in my three year old daughter and even with the added weight over the rear axle the only noticeable difference was slightly lighter steering. It was still as confident and predictable as when unladen. Braking was a bit of a mixed bag though. While I can see the benefit in discs for all weather braking and saving your rims I didn't find the TRP's had either the braking power or control of a well sorted rim brake. The front lacked the real bite I was expecting and the rear was way too easy to lock up. The Microshift Xona gears were a pleasure to use and the slightly clunky feel of the changes suited the Tripster. Moving the chain across the 11-28 cassette proved no bother whether under load or not and the indexing stayed in tune. That decent spread of cogs plus the 48-34 on the Truvativ Elita chainset makes for comfortable in the seat climbing. There's no point getting out of the saddle on the climbs as it won't respond, so sit down, spin the pedals and it'll cruise on up any slope. The Maxlight wheels are certainly strong using a 32 spoke three cross build. With 200 miles a week commuting on potholed back lanes and using the canal path these wheels took a real hammering. Hitting every pothole and rough surface I could resulted in no loss to trueness or tension. Even a trip to the woods trying to keep up with a mate on a full suspension mountain bike as we flew downhill hitting every tree root I came across had no effect on the build. All in all the Decade Tripster is a cracking frame for £499 allowing for a one bike does all if you haven't got room, funds or need for a fleet of bikes. As a commuter the Tripster really shines though as whatever the weather you're going to make it to work and back. There are no real downsides either; if I'm being picky the tape wrapped round the fork leg holding the brake hose is a bit naff. 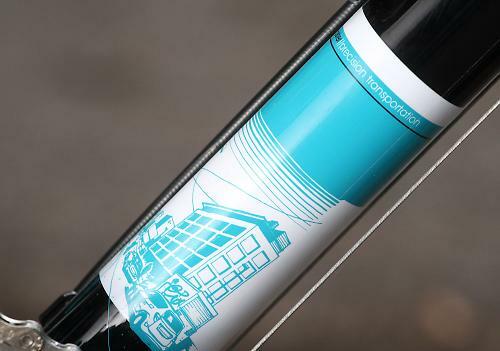 Other than that the frameset is perfectly designed for its intended use (or uses) allowing virtually any bike style to be created from a single frame. The paint stood up to being pelted with small rocks and gravel from the trails and the balanced feel from the geometry means you can ride it as hard or easy as you like and it always responds the same – no surprises. Being able to just grab the Tripster and ride wherever I wanted regardless of terrain or weather was the deciding grin factor. It was decidedly relaxing to ride off into the unknown on my wide knobbly tyres. The frameset is a great base to start building your perfect all round bike from. "The new Tripster is a unique frameset, designed as a 'fast commuter', but it can be built in a number of different ways to exactly suit the riding style of the individual." Decade's blurb has it pretty much spot on here, there are so many uses and options for the Tripster its unbelievable. The quality looks good with the deep gloss paintjob and logos give a top end finish. The frame is 7005 double butted tubing while the fork has carbon fibre legs with an alloy steerer. Our 54cm had a top tube length of 53.4 ctc which coupled with the 15.0cm headtube gives a slightly upright position ideal to the type of riding the Tripster is aimed at. Yes, the components our test model was equipped with helped absorb the vibration but the frame itself lets very little through in the first place. Yes, the frame isn't harsh at all but doesn't show any signs of flexing either. Good, especially off road which was probably more to it suiting the tyres better. Only with the mudguards on. How would you describe the steering? Was it lively, neutral or unresponsive? Very balanced, quick enough without being twitchy. Loaded or unloaded the handling is good with plenty of feedback. The saddle was supportive and comfortable. The FSA bar/stem combo was stiff helping on the rough terrain. The wheels and tyres rolled well enabling you to keep the average speed up. Not really what its about but it does enough to get you out of trouble. Seemed to stand up to the dust and light mud off road. I was impressed with the Microshift gears. A bit clunky to start with but this was bedding in throughout the test period. Fast rolling and pretty lightweight. The Maxlight wheels were great, I gave them a real pounding and not a single grumble. 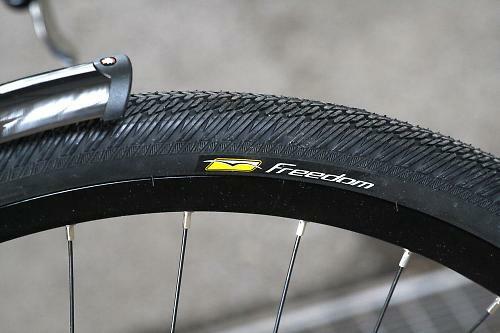 The Freedom tyres did a good job on gravel and rolled pretty well on the road too. The shallow drop of the FSA bars complements the Tripster. All the components worked well. There is nothing bling here but if it was it would only look out of place. The solid look and feel of the FSA front end does what is required. The value rating above is just taking the frameset into consideration as the cost of the build is going to be down to your component choice.